Since its inception in the famous 1936 paper by Birkhoff and von Neumann entitled “The logic of quantum mechanics” quantum logic, i.e. the logical investigation of quantum mechanics, has undergone an enormous development. Various schools of thought and approaches have emerged and there are a variety of technical results. Quantum logic is a heterogeneous field of research ranging from investigations which may be termed logical in the traditional sense to studies focusing on structures which are on the border between algebra and logic. For the latter structures the term quantum structures is appropriate. 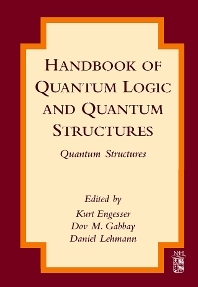 The chapters of this Handbook, which are authored by the most eminent scholars in the field, constitute a comprehensive presentation of the main schools, approaches and results in the field of quantum logic and quantum structures. Much of the material presented is of recent origin representing the frontier of the subject. The present volume focuses on quantum structures. Among the structures studied extensively in this volume are, just to name a few, Hilbert lattices, D-posets, effect algebras MV algebras, partially ordered Abelian groups and those structures underlying quantum probability.